Summary: It is possible to sin by trying to do too much, attempting so much that we cannot do anything the way it should be done to the glory of God. This is the first indication we have had in this epistle that some of the Thessalonians we’re so excited by all the wonderful things in the Christian faith that day were not bothering to earn their living. But there are a number of indications in the Thessalonian correspondence that this was so (especially 2 Thessalonians 3:11). A number of possible reasons for this have been suggested, but it is most likely that it arose out of Second Advent speculations. The Thessalonian believers had learned very well that the Lord would be returning in mighty power, and evidently some of them felt that it would be very soon. Accordingly there was no point in continuing in some steady job. It was much more realistic, they evidently reasoned, to be about the business of proclaiming the soon return of Christ. If they had need of this world’s goods in the meantime, why, there were others, Christian brothers, who could be relied on to come to their rescue. This kind of thing can be done from a sense of serious purpose, but, human nature being what it is; it can easily degenerate into downright laziness and idleness. People can be so taken up with the spectacular that, with excitement over the near approach of the Lord, that they pass over the important things of everyday life. So Paul gives attention to such matters, and counsels these brothers to mend their ways. Paul also warns the Thessalonians that they should be occupied with their own affairs and not with the affairs of others. Probably some of them were busybodies and gadabouts, meddling hither and yon. Paul did not want the believers to live such a life. In 2 Thessalonians 3:11 he said, “For we hear that there are some which walk among you disorderly, working not at all but are busybodies.” You may rest assured that those who meddle in other people’s business always wreck their own! If we take care of our own affairs and remain alert concerning our own life, we have little time to metal in the affairs of others. 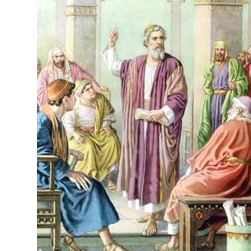 Some of the new Christians remembered hearing Paul discuss the second coming of Jesus. They reasoned inaccurately that since Jesus was coming soon, they should quit their jobs and wait for His appearing. You can imagine the economic problems that practice causes for the Christian community with so many refusing to work and expecting to be supported by other believers. As you know, idle persons usually create problems for themselves and others. So Paul wrote, “Make it your ambition to lead a quiet life.” Then he gave three words of advice about responsible living as Christians. • Lead a quiet life: “Make it your ambition to lead a quiet life.” In the excitement and expectancy about when Jesus would return, Paul urged them to, “Keep calm. God’s in control. Go back to work.” It’s good advice. A responsible Christian avoids embarrassing others or creating scenes. It’s tough for even the most committed soul winner to win a family to Jesus who live next door to a discourteous, inconsiderate, though prominent church member. It is possible to sin by trying to do too much, attempting so much that we cannot do anything the way it should be done to the glory of God.